Beatrice T. “Bea” (Fox) Lowery, 90, of Fostoria, passed away at 8:16 p.m. Tuesday October 16, 2018 at Good Shepherd Home, Fostoria surrounded by her loving family while holding hands with her husband of 70 years. She was born March 24, 1928 in Fremont to the late Frederick Peter and Gertrude Christina (Magrum) Fox. She married Ramon Charles Lowery on June 28, 1948 at St. Joseph Catholic Church, Fremont and he survives in Fostoria. Also surviving are ten children, Charles J. (Sue) Lowery, Bloomdale, Diane M. (Bill) Hudson, Findlay, Deborah (the late Dan) Lowery, Bradner, Kathleen S. (Dan) Mowrey, Elgin, TX, Rose A. (Chuck) Metzger, Fostoria, Carol J. (Joe) Gruss, Rossford, John A. Lowery, Findlay, Laura R. (Jim) Unferdorfer, Massillon, Annette M. (Tom) Unferdorfer, Wooster, Pamela J. (Jeff) Van Cleve, North Canton and Angela M. Dye, Canton; 28 grandchildren, 30 great-grandchildren and 3 great-great grandchildren; a brother, Harold B. “Skip” Fox, Fostoria; and a sister, Pauline Marie Lowery, Fostoria. She was preceded in death by a son, Daniel Lowery and 5 brothers, Louis, Ralph, Richard, Herbert and Donald Fox. Bea was a homemaker and a member of St. Wendelin Catholic Church and its Rosary Altar Society, and the former Daughters of Isabella. 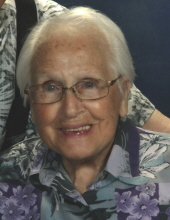 She was a member and supporter of the Arcadia Music and Athletic Boosters and longtime member of the Ford Wagon Train camping group. Ramon and Bea enjoyed wintering 27 years at Magic Valley Park, Weslaco, TX. Visitation will take place on Friday October 19, 2018 from 2-4 & 6-8 p.m. at HOENING & SON FUNERAL HOME 133 W. Tiffin Street, Fostoria where a Rosary will be prayed at 7:45 pm. Mass of Christian Burial will be Saturday at 10:00 a.m at St. Wendelin Catholic Church with the Rev. Todd Dominique, presiding. Burial will follow in St. Wendelin Cemetery. Memorials are suggested to St. Wendelin Catholic Church or the Blanchard Valley School & Industries. To send flowers or a remembrance gift to the family of Beatrice T. "Bea" Lowery, please visit our Tribute Store. "Email Address" would like to share the life celebration of Beatrice T. "Bea" Lowery. Click on the "link" to go to share a favorite memory or leave a condolence message for the family.